John Taggart asks his readers to read his poems aloud. You could take this with varying degrees of seriousness. You could take it as a naïve or wistful resurgence of nostalgia. Or it may emphasize the importance of a highly original form of prosody, perhaps with links to several stages of interaction in linguistic evolution, practical literacy, and poetry in general at a time when it could be seen both as a deeply troubled art and an art with more potential than most of its practitioners realize. If this sounds hyperbolic, I’d like to point out a major cultural and linguistic shift which is too large to discuss in this essay. With the printing technologies of the Industrial Revolution, the immense growth of population and the rapid spread of literacy that accompanied industrialization, silent reading became more common, and silent readers read at speeds that had nothing to do with speech. It is possible that this introduced major shifts in communication and perception, as did the advent of literacy in one epoch and the invention of printing from moveable types in another. But we don’t need to go into such difficult and large-scale speculation to understand that the most basic groundwork of poetry, an art which had been solely defined by patterns of sound from the preliterate days when oral-formulaic composition held societies together, had irrevocably changed with the changes in reading practice. One of the factors in the growing experimentalism in poetry between the mid-nineteenth and mid-twentieth centuries may be seen as a response to the waning of the many facets of sound in reading. 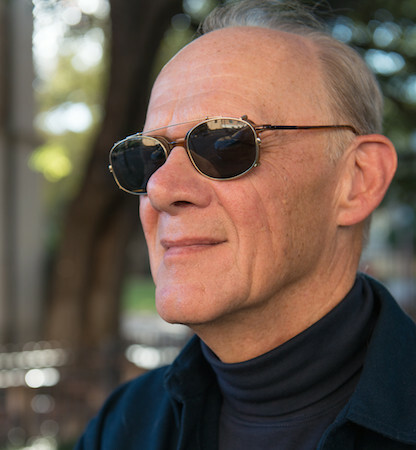 During the period from the mid-1970s to the early 1980s, John Taggart developed a dynamic prosody, some of its elements derived from music of different eras, some from the practices of other poets, some through combining several techniques he developed himself. Initially, Taggart was building up a vocabulary of acoustic patterns. Later, he would combine many of them in such a way as to make the combination part of the art. In the general literary environment, the number of diverse “poetic” methods in practice, and the number of poets working in them, had become so large that it seems unlikely anyone could keep track of them all, or see much that all of them held in common. Some poets moved partly or completely away from the sonic base of traditional poetry, composing sequences of lines whose breaks had no significance other than looking like those of older forms of poetry, writing a growing number of different types of prose poems, or seeing the basis of poetry as motivation — as a type of sentiment or a special utterance proceeding from an “exalted state of mind” or from “heightened perception” or as a means of exploring referentiality or “interrogating” various forms of language and its uses or as a vehicle for recording personal epiphanies or as an art based in certain types of “image,” either created in the imagination by the suggestive capacity of words or by literal images on the page. Some of the confusing nature of different forms of prosody as the twentieth century moved on may be suggested by poets who took the same sources in different directions. Outside most of Taggart’s antecedents, Beat poets and some Projectivists (e.g. Joel Oppenheimer) evolved long lines inspired and informed by Bop jazz. It’s almost impossible to notate the precise jazz parallels of these poets, but it’s not difficult to hear if you’re familiar enough with the music and the poetry it suggested. Taggart took ideas from the same jazz musicians, but with results that bear virtually no resemblances to the prosody of other poets who worked from the same sources. Many of those who did not follow any of these directions concentrated on sound properties which had not been explored in previous periods, or tried to work with sonic properties from ancient or non-Western sources. For simplicity’s sake, I’ll just say that those most important to Taggart cultivated a sense of what many of them called “musicality” as a base for their prosody. In his early work, Taggart became increasingly adept at a number of different types of musicality. He was particularly fluent in those that had evolved from the work of poets with a strong background in actual musical practice, and to some extent, those disciplined in traditional verse forms. He developed his ear from Louis Zukofsky, part of whose prosody evolved from music, and from the poetry of HD, who had a rigorous background, beginning early, in classical Greek verse. Robert Duncan, like Zukofsky, with reinforcement from Ezra Pound, had ears trained in music and in classic prosody. Taggart could also pick up on recently invented rhythms, such as those which Robert Creeley created with short lines and “syncopated” line breaks, with variations (melodically neutral to complex) between the breaks. Duncan and Creeley worked out highly individualized procedures while taking part in the development of the more general Projective Verse initiated by Charles Olson: their multi-tiered practice suggesting some of the dynamics of invention which the drive for a viable and evolving musicality encouraged. Perhaps above all, Taggart adapted ideas from his own listening to music from European traditions beginning in the medieval era and encompassing those of American jazz. In the later part of this early period, Taggart not only developed new forms, but he combined them with older forms, and even with the hybrids that resulted. Taggart worked with memory in ways few other poets did at the time. His use of memory worked through characteristics of composition and of reading at a time when poetry was redefining itself. In using forms of prosody which are insistently aural, Taggart moved away from the ethereal and abstract character which silent reading implied and fostered. A silent reader can enter a “personal space” which can have special qualities and characteristics. Such personal space does not duplicate the character of reading aloud, but creates new dimensions of reading and new opportunities for writers and for readers. Like freedom from received forms and fixed definitions of poetry, these dimensions become new areas to explore. Yet if a writer who expects the “audience” to read silently does not take this space into consideration during composition, the poem can become more like the consumer items that people in our society take for granted and which can eat away not only the consumer goods themselves but the society around them. In practices such as printing books, I was doing something like asking readers to read the poems aloud: I was making the books that subtly insisted on their tactile qualities and other cues to handmade origin, partially in order to fight against the deadening effects of a social and economic order that had no place for poetry. Taggart was making poems tangible by composing them for vocalization; and even for the sense or memory of vocalization if the poems were read silently. This was particularly important in an environment where people seldom read aloud and often were scarcely aware of poems as constructs that could be heard. The complexity of Taggart’s prosody at this time is one of the reasons why he is particularly justified in asking his “readers” to read his poems aloud. Reading them in addition to hearing them augments and emphasizes their sonic complexity. If members of Taggart’s “audience” do not read and hear the poems, they probably won’t catch many of the sonic layers in the poetry. They will miss other layers of significance, too. In the long run, it is possible that Taggart will emerge as a pivotal or transitional figure in larger changes in poetry. If so, although it may seem paradoxical, it may be particularly important for poets deliberately and consciously working with the “space” and “unspecified time frames” of silent reading to read Taggart aloud. They may better understand what they are doing by understanding what they’re discarding or ignoring. If my speculations about silent reading prove untenable, using the concepts I put forward as a heuristic device may have some value in calling attention to sound properties of poetry, if nothing else. Certainly, however, continuing to ignore major possibilities opened up by silent reading and the abandonment of received forms is an unfortunate waste. Although I was interested in Taggart’s use of memory in formulating a new prosody, and worked with related ideas and principals, neither of us was doing work that derived from the other. Even when we picked up ideas from the same musical sources, the results were significantly different, and only distantly related in the finished poems. Still, the fact that we were both working with related principles gives me a place from which to consider Taggart’s work. Since prosody is in itself a difficult area to explore in an environment of change and loss of constants, use of “memory” as an element of verse in a field where even “musicality” is undefined, if not ignored, seems particularly useful. My first contact with Taggart began with an exchange of letters in regard to his magazine, Maps, in the late 1960s. This was after I began publishing books using mimeo machines in 1966, but before I went through my apprenticeship in offset printing, beginning in 1970. I had planned to set up a cottage industry as the center of activities, specifically literary to generally sociopolitical. I made the first payments on a house within easy walking distance of the second largest academic library in the state, in a neighborhood in Milwaukee that included writers, artists, musicians, scholars, and activists, with a healthy compliment of co-ops and other related ventures, including an automobile mechanics’ collective and a full clinic. I bought my own press a year later, and producing books became integrated with everything else that happened in the house. In the next move, I cofounded the Water Street Arts Center with Pat Wagner in 1972. This went through a number of experimental stages perhaps best marked by changes in personnel, with Pat leaving in 1975, and the hiring of Karl Gartung as store manager in 1977, when funding for the purpose became available. With Gartung, I cofounded its heir, Woodland Pattern Book Center, at the end of the decade. The decentralized cottage industry approach had plenty of cognates and antecedents. Some new dimensions were just coming into possibility, and some have particular relevance now. In this period, for instance, people had begun to talk about practical solutions to environmental problems, including the use of recycled paper. Most recycled papers available then as now weren’t much better for the environment than virgin pulp stock. I was one of a very, very small number of printers of any sort who produced books on truly responsible papers. Working the way I did was one of the few ways I could find out what papers were good, and which simply used the jargon of environmentalism as a sales device. In the 1970s, the best papers, which tended to be difficult to work with, needed empirical testing. For the most part, they did not get it. HTML coding did get the widespread testing by an adequate number of people on “the bleeding edge” of the tech, albeit it in a completely different way and for different reasons, in the 1990s. I began writing this essay at the end of 2012, the hottest year on record, with massive floods, melting polar ice aided by oil drilling, and legions of other ecological malpractices and disasters. I’d like to see a surge in understanding of the complexity of environmental issues, and how much they depend on integrating as much of that understanding as possible into the fabric of daily life — but it’s probably being unreasonably optimistic to hope for that. Should I bother to mention the collapse of the middle class and the rapid growth of neofeudalism? I wanted writing, publishing, and other literary activities integrated in the same holistic, human-scale, internationally connected but not centrally controlled exchange system I tried to create in the cottage industry paradigm. Among other dimensions of practice, that meant I was trying to avoid becoming a member or adherent of any of the literary schools which were becoming more rigid and removed from each other. I wanted to develop as extensive a vocabulary of methods and goals as possible. I saw America’s multicultural base expanding rapidly, and wanted to create a poetry that reflected this diversity by working, on one hand, with multiple literary and artistic cultures from their origins to their latest development; and, on the other hand, with the resources of a century of European and American avant-gardes which also seemed to be gathering momentum. In publishing, as in writing, I tried, and continue to try, to combine pluralism and concentration. During the period when John Taggart was developing his prosody to its most complex, most of the books I published were by a relatively small number of people. I published more than one book by half of them, and worked with them on related literary efforts. Some, such as Barbara Einzig and Toby Olson, may relate to the whole project (and Olson may have been a friend of Taggart’s), but they didn’t form a direct and meaningful part of a literary continuum with him. Others did, but in different degrees. Jerome Rothenberg covered nearly a complete spectrum of innovative modes; however, the affinities between his work and Taggart’s are abstract, and may be strong or may not exist at all, depending on how you see invention and the reuse of the work of artistic antecedents. Jackson Mac Low and bpNichol related to each other in exploring visual dimensions of language and in different approaches to sound poetry and performance art. Theodore Enslin approached verse composition from a musical background, but did so in a way that was not immediately audible to those who did not understand his training, practice, methods, and antecedents. Taggart stood between Mac Low and Nichol on one hand and Enslin on the other. Taggart produced poetry based in musical invention, as did Enslin, but though his musical devices were more immediately noticeable than Enslin’s, he did not move into song or sound poetry, as did Mac Low and Nichol. In deciding whom to publish, I was not thinking only, or even primarily, of prosody as such; but it seems important to note how much differences and similarities in such practices follow differences and similarities in other areas. It also seems important how many types of artistic spectra a relatively small number of poets who don’t belong to a single movement can suggest or reveal. The practice of publishing multiple works in multiple forms by the same writers is part of what I called “triangulation:” presenting the work of poets from more than one point of view, and as contextualized and interrelated with whatever might enhance it and make it not only more dynamic, but, perhaps paradoxically, more fully itself. A partial description of this practice appears in the introduction to “Some Volumes of Poetry.” I can sketch the activities of one version of the process easily enough in Taggart’s case: I wrote several reviews of his work, published poems, self-commentary, and a bibliography in a magazine, published two books, Dodeka and Dehiscence, which seemed to mark major transition points in his development, arranged readings for him, published an audio tape of him reading, and commissioned him to edit a symposium. When possible, I arranged for other people to write about the work of those I published; I asked those I published to comment on what they were doing themselves; and commissioned them to write about, edit, and create group commentary on other poets and artists — both to contribute to a broaderliterary ecosystem, and also to try to encourage each writer to sharpen his or her sense of their own work by the way they interacted with their peers. My first publication related to John Taggart was a 1974 review of Pyramid Canon, a portion of The Pyramid Is a Pure Crystal, in Margins magazine. My correspondence with Taggart had become important and detailed by ’74. Going by a list of publications for Stations magazine which appears to have been compiled by Taggart himself,the Pyramid review was one of the first regarding his poetry published anywhere. The next year, I published Three Poems Beginning with Lines by HD and an essay, which I believe was part of his doctoral dissertation, in Stations magazine. Touch, fill a white square. In composing Pyramid Is A Pure Crystal, Taggart had used physical models for the disposition of words, and was doing something similar with Dodeka. 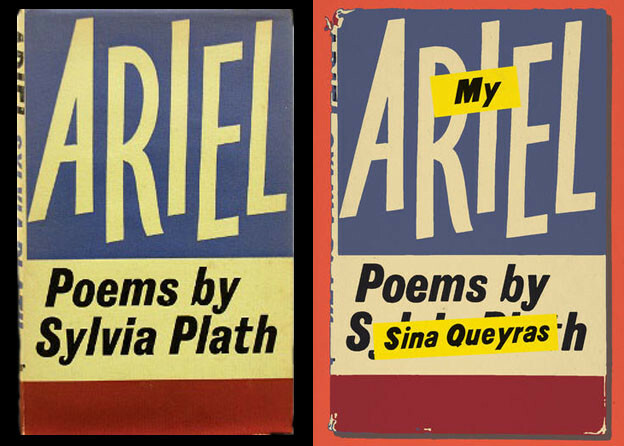 Perhaps the graphic nature of the two books echoes the three-dimensional space of the models. Taggart does not continue the use of an identical number of syllables in these four lines through the other arias, but the even line length helps keep this first one from some of the greater strain in many that follow. The line breaks don’t work as strongly against the sense of the text as some of those that follow, either, but there is enough stress in the breaks to create the base of a rhythm for this brief poem. Some of that rhythm comes from the emphasis the line breaks place on the words on both sides of the breaks. If the line breaks weren’t enough, internal phrase breaks and punctuation add more. Although Taggart is using the sparse punctuation which will become more important to him later, he carefully marks internal breaks in the first and third lines with a colon and a comma. Since this is a relatively smooth passage, the symmetry of the first and third line internally breaking in the middle balances nicely. This poem’s syntactic construction includes some moderate ambiguities. Do seeds spill seeds within seeds, or is “seeds within seeds” an amplification of “seeds spill”? Each new line adds a bit of surprise and may initially suggest that someone reading the poem aloud back up and reconsider phrases before deciding on a final reading. Frequently, the need to go back over a phrase creates a pattern, and one in which the phrase may include a variation in the repetition. The ambiguities suggest a pace for reading, whether silently or aloud. Bearing more traditional poetry in mind, alliteration adds to the poem: the massed s sounds in the first two lines continue in the third, but disappear in the fourth. This bears a slight resemblance to a device used in Old Norse verse, where the release from repeated consonants is as pleasant and as dynamic as their initial repetition. However, there is a near-rhyme in “sparks” and “dark,” and this device helps clinch the image of sparks in a dark house, whether the image seems sinister or pleasant, whether the reader understands the seeds in the poem as suggesting those which return Persephone to the underworld each year, or the home stores of harvest, or a serious autumnal ritual, or even something as odd as the current observance of Halloween. It’s hard not to notice the words and phrases repeated from the first aria. Something important is happening in these repetitions. Many devices used in poetry depend on memory of sounds. If you didn’t remember sounds, you wouldn’t be able to hear rhyme or alliteration, for instance. But a fair amount of time passes between some of the words and phrases in the arias and their repetition in the unisons. This is quite different from what we usually think of as traditional forms of prosody. The poet can create a number of sonic patterns and long-scale tonalities by letting the sounds blur or by pushing the reader to strain a little to remember the previous similarity in sound. For some, memory across time can create a haunting effect; for others, it can create a sense of space. Words not found in the first aria come from other arias. This will become stronger as the work moves through its arias and unisons, so that it creates patterns of repetition within repetition and cumulative interrelations on top of them. “Waves breaking” and “law breaking,” for instance, can echo and reverberate between each other as they create multiple layers of significance, reinforced by checks and tensions of repetition and variation in a repetitive framework. At this time, and with this poem, some of the musicality developed by Zukofsky and Duncan came into play, though not in a heavy-handed or overbearing manner. Near repetitions (something that will become more important later) and exact repetition play significant roles. The way “eyes on fire burn” appears with a variation at the beginning, and immediately prepares for a transition, is a good example of the way variation on repetition moves out of the strictures of the unisons’ sonic patterns into a freer cascade of sound. With this work, Taggart was using several different forms of prosody at once. That doesn’t just mean different conventional devices such as alliteration and assonance, but syncopated line breaks and several types of repetition and near-repetition — and playing those in the arias and unisons against each other. Our most serious correspondence regarding method apparently began in 1974, regarding The Pyramid Is A Pure Crystal. I’m not sure when we arranged to publish Dodeka, but my notes suggest that it was before Taggart completed writing it. Whenever it was, I was thoroughly enthusiastic, and published the book in 1979. I have mentioned the importance of using the reader or hearer’s memory in relation to repetition in Dodeka. By the time I published the book, I had been working with related principals for a number of years. Though related, and similar in some general properties, our sources and purposes were significantly different. A Book of Questions and Goddesses was one of the places where I tried a number of different approaches to what I sometimes called “acoustic memory” and “shadow memory.” This line of development, and the terminology I used for it, was exploratory, casual, a personal usage, not something I wanted to stress so much that whatever I did became entangled in it, or in an inadequate understanding of it. That meant I could keep it loose and didn’t have to get lost in defining it too rigorously while I was working with it. I used “acoustic memory” for the phenomenon generally, and at times for situations where the reader or hearer would tend to remember phrases, lines, or patterns more precisely, since there wouldn’t be much time between one iteration and another. “Shadow memory” I used for situations in which more time had passed and memory could play different roles. Memory could be less distinct, for instance, or it could make stronger demands on the reader or listener. In Questions and Goddesses, memory had multiple purposes. In prosody plain and simple, I wanted to experiment with different types of acoustic memory for aesthetic purposes, and would have wanted to do so whether they served any other purpose. But in this work, they did serve other purposes: in the first part of the book, sources from the period of the Spanish conquest of Mexico apparently carried memories of previous layers of myth, cultural evolution, and even conquests by other indigenous tribes. I added suggestions of the music of the European conquerors. Acoustic memory did not have to exclusively involve memory within a single poem, but in some instances just might include memory of sound patterns in other poems and other arts or environments. Among the few limitations was the avoidance of confusion of acoustic memory with allusion or quotation. In this book, I kept the source material guiding whatever I did with it, in part to keep the shadows and echoes coming from the right places. Still, I didn’t want to pretend that this was an unalloyed reiteration of the poetry of indigenous Mesoamerica, or anything but a twentieth-century Euro-American response, appreciation, and acknowledgement. In the first section of the book, I took work by Giovanni Gabrieli as a European musical model to interact with the way I set up repeated indigenous source passages. I used strongly separated repetitions along with the type of call and response arranged for the choir lofts of St. Mark’s Cathedral in Venice. The time it takes to get to a repetition puts as much strain and provides simultaneously as delicate and as large a scale melodic pattern as I could manage with shadow memory from a unit which would take about fourteen minutes to read aloud. This section was made up of three such units, and I hoped that some of the audience would pick up at least a few shadows between the units as well as the shadows within each of them. Questions and Goddesses works with sources from Mesoamerica. In the first example, I was trying to make use of shadow memory in playing off several forms of duality and dualism, worked against the more or less contemporary music of the conquerors. Depending on the audience, and the reading, this could create a sense of ceremony with a melancholy undercurrent or a set of mazes with echoes in their passages. The second example could create a sense of magic as well as suggestions of ritual. In the first section, the ceremonial dimensions suggest enclosure; in the second, repetition and echo can suggest procession, whether to a shrine-like destination or for the purpose of delineating a meaningful area by passing across or around it. Throughout the book, the different forms of repetition, including repetition of phrases and use of shadow memory, gave me perhaps a dozen significant variations to explore. By the time I published Dodeka, Taggart had moved on to his most expansive use of memory-and-repetition, and combined it with most of the other acoustic techniques he had worked with so far. Most people commenting on this phase of his work identifiedit with the minimalist music of such composers as Philip Glass and Steve Reich. So it should be, on one level. But Taggart hasn’t simply picked up musical ideas without modifying them or working through them from outside. In his work before this, he had been building up patterns of repetition and playing with memory on a smaller scale. Some examples were close to counterparts in Glass and Reich; others weren’t. To me, this is one of the most important characteristics of Taggart’s prosody at this time. The synergy of methods was reaching its maximum. Readers and listeners could clearly identify a type of music in the poems. The kind of “musicality” of Taggart and poets working from a similar background was still there, and interacting with minimalism, but those who had not developed the sense of musicality could still hear something. A shift in scale or proportion is essential at this stage of development. Moving to the repetition of long phrases with small variations in them, Taggart could build considerably on — and achieve more with — what he had been doing for several years. The use of long lines, instead of individual words, as basic units of composition stimulates as well as makes use of memory. The patterns created by multiple long lines give Taggart opportunities for simultaneous inventions. The long, repetitive phrases are largely what make the sense of musicality more apparent than the musicality in other poets, from Zukofsky to Enslin to Taggart himself before this phase. Their length can also make them easier to remember, or initially seem more memorable, than the shorter lines. hear the traveler who is a bird who so sings. Except for the repetition of the word “sound,” the first line may seem plain and formally unremarkable. Still, that repetition of a word, placed in positions that suggest balance and define symmetrical phrases, has a slightly musical, perhaps even haunting, quality. This line will initiate a variation of the cantus firmus technique Taggart used in a number of ways throughout his oeuvre. In this method, the composer reuses parts of a preexisting melody in a new work. In this instance, the words in the first line get used in different orders throughout the stanza. This pattern of slight changes with each repetition continues through the stanza, through the page built from it, and through the whole poem. “Traveler” may produce a bit of surprise for the reader or hearer, as well as the feeling of appropriateness or understanding, by the revelation that the traveler is a bird, and, finally, a bird that sings. The singing bird can call up a large number of associations, and with them, tones, emotions, memories, symbols, and so forth. Throughout the poem, the patterns of repetition can work in several ways. The repetition can produce an almost hypnotic absorption, a rapt fascination such as one might feel while completely engaged in a form of music which the listener finds most entrancing. Then again, the slight variations can pull the reader or listener in another direction: expecting and waiting for each change throws particular emphasis on each word, creating suspense, caution, anticipation, and all the colorations associated with such conditions, from irritation to edginess to puzzlement to eagerness to amusement to a sense of thoroughness in working out possibilities. Curiously, the two general responses, absorption with the flow of repetition and watching for change, could be considered almost as opposites — but that’s one of the ways that prosody such as this becomes so dense. Concentrating on the repetitions as repetitions produces a condition of smoothness and serenity, with a sense of time passing easily and perhaps pleasantly as the phrases maintain their unity and the poem seems more a procession of phrases than words. Concentrating on the variations produces a sense of anticipation and curiosity, in which the reader or hearer anticipates variations, individual words rather than phrases become the center of focus and significance, and the irregular stresses on the variants creates a slow and emphatic rhythm rather than a flowing melody. A good deal of the response depends on the reader or hearer’s state of mind, and assumptions or anticipation for this particular reading of the poem. This can change from one reading to another, or even within a single reading. What has been most remarkable to me is that these two types of response can alternate, overlap, and even at times seem close to occurring at the same time. For me, one of the ways that the cumulative repetitions worked in regard to each other, and cumulatively through the poem, and perhaps in interrelating or balancing the hypnotic effect and the effect of having to be highly attentive to the details of small variations, depends on acoustic memory or shadow memory. As already noted, Taggart and I had been interested in various forms of polyphonic music. I tried some multi-voice performance scores, but generally wasn’t happy with them. Works such as A Book of Questions and Goddesses gave me the opportunity to use shadow memory to suggest polyphonic music. I don’t believe that such devices as counterpoint can be produced by a single vocal line, and have objected to poets using terms such as “counterpoint” either as a metaphor or without understanding the musical term. Shadow memory, however, whether the types I used or the types Taggart used, can suggest polyphony, particularly through forms of memory which include not only memory of previous lines or phrases within the poem, but also the memory of music heard previously, particularly music heard repeatedly over time. Response to variations adds another layer of depth to Taggart’s acoustic repertoire. In the poems of this period, Taggart occasionally added layers of sound patterning as direct quotes from fully formed musical compositions. Such quotes included a passage from a Tarahumara ritual song, which would be unintelligible to nearly any audience who might hear Taggart read it, but which added greater complexity and resonance to two poems. Taggart could just as easily incorporate a familiar phrase from an R & B song or a word or phrase from a language his audience might consider less esoteric than Tarahumara even though the words could be just as unintelligible. Traditional devices such as alliteration and assonance reinforced the rhythms of the repetitions or slight variations; and even syncopated line breaks could work with comparatively long lines. Contrasts between the lengths of repeated phrases, or nearly repeated phrases, could also add to the textures of poems in this period. It seemed that at this time Taggart was achieving a prosody as dense and as complex as it could get without moving into multi-voiced performance or song or working with instrumental accompaniment. And it seems likely that Taggart himself felt he had done as much as he wanted with this kind of density. To borrow, albeit imprecisely, Lettriste terminology, he had reached maximum amplification, was ready to move on to a period of chiseling. I arranged a reading in Milwaukee for Taggart in the early 1980s. One of the poems he read was Dehiscence. In this poem he seemed to be making major modifications in the methods and purposes of what his friends had started calling his “minimalist” poems, though I wasn’t sure where he was going with the new poem. I’m not certain if he had sent me drafts of Dehiscence before the reading. But I’m confident that hearing him read the poem was a major factor, if not the major factor, in convincing me to publish it as a book. letting go one’s hands to clap hands . The poem quotes the Bo Diddley classic “Who do you love?” and the Tarahumara song from “Peace on Earth.” The poem even includes scatting, whether quoted or written as a type of cadenza. The sound patterns start at least as densely as those in any of the minimalist poems: but now the pattern of diminishing sounds creates the acoustic equivalent of negative space. Negative space could function in several ways: it could create rhythmic patterns somewhat similar to those created by syncopated line breaks; the plotting of pauses or silences could form an almost contrary rhythm; and the negative space could make room for a field where acoustic memory could function in greater freedom than it had in the previous works. In addition to the relatively simple overall pattern of decreasing “material,” the words that dropped out could virtually ask the reader or listener to anticipate those which would follow them into absence as well as to help the reader remember them when they were gone. Since the poem isn’t simply a large mechanical pattern that drops equal parts at regular intervals, but one that at times adds new material, and fully explores the interplay of textures as diverse as the Bo Diddley and Tarahumara songs, the negative space can play an active, almost aggressive, role. I was delighted with the poem when I first heard it, and that had not diminished when I finished producing it as a book in 1983. Between publishing the two volumes, I also published an audio tape of Taggart reading his first five books as part of my New Fire series. This was apparently the only audio recording of Taggart reading produced for general distribution. As far as I can determine, Rochelle Ratner and I were the first to write commentary on the poetry exemplified by “Slow Song for Mark Rothko.” Ratner and I worked on our comments together, reading drafts to each other over the telephone in the days before email. Our essays appeared in the 1979 John Taggart issue of Gil Ott’s Paper Air magazine along with the first publication of “Peace on Earth,” and are now online. In this instance, we stumbled into doing something like “triangulation” without planning to. It’s also interesting to note that even though we worked in very different modes in our own poetry, we could discuss our work, not in spite of our differences, but in part because of them. For Ratner and for me, a development in prosody was news — an addition to the “news that stays news.” What poets take as news can be important in itself. However, apart from this kind of news, other things were changing, and by the mid-1980s, I began a period during which I wrote little and published few books. My last Taggart publication came quite a bit later: after the mid-1990s, I published “Slow Song” and “Inside Out” on the web. In 1994, I began working with what now seems crude HTML coding to build a website that would allow me to try more elaborate forms of triangulation and other means of presentation and interrelation. I could have done a survey or homepage devoted to Taggart, but he was not interested in the web at the time. I was, however, glad to have gotten permission to use these two poems, and put them online along with the essays Ratner and I had done. These entries produced another simple form of triangulation. This was all the Taggart you could find on the web for many years. I like to think that this introduced a fair number of readers to his work who would have missed it otherwise, and who often enough sought out more after the introduction. After Dehiscence, Taggart moved on to other projects, such as Remaining in Light: Ant Meditations on a Painting by Edward Hopper. And he went on to other poems, generally using variations of the verse forms of the “middle period,” including Dehiscence as the transition to the later work. What I’ve seen in the work that followed is a continued interest in something resembling what the Lettristes called chiseling — including exploration of varieties of acoustic memory, and several beautiful uses of shadow memory. There Are Birds includes its share of examples. The long poem “Unveiling/Marianne Moore” includes interesting and profound instances, albeit less insistent, less prominent, and perhaps less commanding — or less a model of invention. The “window[s]” in the second line not only set up repetitions and linguistic ambiguities, aided by lack of punctuation, which a reader of Taggart should find familiar enough, but, on a basic and simple level, the “windows” repeat the phrase “two windows” at the beginning of a three-line block just before this one. The only difference between them is that the first begins with a capital T. The repeated lines are made up of two parts which closely resemble each other, and resemble the middle-period works where Taggart used the potential for sounding like repetition or emphasizing variation in similar blocks of sound. The role of the interrelation of number works on other levels, such as: “there are birds” (plural), “there is birdsong” (singular, even if the birds aren’t following the same melodic pattern). Other lines in the cadenza move freely, though containing repetitions internally and at nearly as much distance as a small poem like this allows. The second and ninth lines (both following “there are birds there is birdsong” iterations) begin with the words “unmourning and mournful” but conclude with a different phrase. repeated three times, with the only difference, again, being the capitalization of the first letter in the first line. The space between the second and third iteration of the line is about three times that between the first and second. This pattern has been used frequently and by a fair number of poets. But the contrast between the dynamic patterns of just a few words in 2 and the simplicity of 3 is delightful, and does a good job of summarizing and condensing the patterns of repetition and the use of acoustic and shadow memory through an extensive period of exploration. It’s interesting to note that the form, nature, and use of a “cadenza” have changed considerably through its long history. And changed in the small scale of this article since I noted a cadenza-like pattern in an earlier poem by Taggart as a means of trying something like shadow memory in an essay. How should we understand it in There Are Birds? The term can mean a flourish near the end of a phrase in a solo; or a solo passage, either improvised or specifically notated, played in key positions in a concerto. These basics include many variations. Generally, a cadenza doesn’t conclude a longer work, though it comes, often enough, immediately before a final coda. In There Are Birds, similar and/or identical phrases cross between cadenzas 2 and 3, perhaps suggesting something like syncopation in line breaks, as well as abbreviated versions of near-repetition in stanzas and pages. Each cadenza could be moved to separated positions in earlier parts of the book, as in a concerto. However a reader understands these poems, they suggest multiple possibilities. These may include shadow memory, but even if they don’t, they echo other multi-layer methods derived from musical sources in Taggart’s poetry. We live in a literary environment where possibilities of poetic form seem to expand at an ever increasing rate, and the number of people writing under the search tag “poetry” grows at a similar scale, but most of the potentials for prosody seem to go unused. It is reassuring, at least to me, to see an unassuming poet whom I published in what seems a different world, continue to evolve new patterns out of ideas such as cadenzas, and quietly ask his readers to read his poems aloud, however quaint that may seem. He apparently understands how much he’s asking; and certainly realizes the kinds of rewards that such reading offers to people working in modes unrelated to his. Is it paradoxical that his request could mean a great deal to people trying to make poetry from wordless computer codes, where simple tweets get rewritten by machines over and over in transit, possibly being bounced off satellites moving in an environment where sound waves can’t exist without a medium to carry them; and that his request could mean just as much to those who may create an optimistic future out of the wreckage of cities like Detroit, in the shadows and memories of musical ideas which evolved and flourished in multi-layered conjunction with a previous human-industrial ecosystem? 1. For extensive reflections on the beginning of the organization, see Water Street Arts Center, Part 1. For brief notices of stages of development, see this Milwaukee Journal article and this excerpt from a local history. 2. John Taggart, John Taggart Reading His First Five Books (Milwaukee: Membrane Press/New Fire Audio Books, 1979). 3. A Symposium on Theodore Enslin, guest edited by John Taggart, from Karl Young’s Margins Symposium Series; Truck (1982). 4. Silliman’s Blog, January 7, 2005. 5. Karl Young, Review of Taggart’s Pyramid Canon (Burning Deck Press) Margins, no. 15 (1974). 6. John Taggart, The Pyramid Is a Pure Crystal (New Rochelle: Elizabeth Press, 1974). 7. “Three Poems by HD” and “What Does It Mean to Say a Poem Is an Object?,” bibliography by John Taggart, Stations, nos. 3 and 4; Milwaukee, 1975. 8. For more on Taggart’s working methods, as he described them to me in our correspondence, see my essay on producing John Taggart’s books in this section of Some Volumes of Poetry, and the quotes in Robert Duncan’s introduction to the book. 9. John Taggart, Dodeka (Milwaukee: Membrane Press, 1979). 10. Karl Young, A Book of Questions and Goddesses (from Middle American Dialogues) (Ann Arbor, Salt House Mining, 1978). 11. Click here for a reproduction of the second unit. 12. I had also begun work on poems which I latter called Fractals, and which eventually included book-length pieces such as Orange Gold. These could employ as many as a dozen different lines of development presented on the same page or set of pages. They worked with acoustic memory and shadow memory, but they were meant to be read in a manner which virtually forced a different reading each time a piece was vocalized or even read in silence. The constant change in these works may have been a dimension of what could legitimately be considered musical, but still not the kind of musicality Taggart and other poets, and even I myself in other works, had in mind. This is a crucial distinction to make in understanding prosody and in trying to make the most of the freedom the abandonment of traditional patterns made available. See the bio page linked from this essay for more on Fractals, including online publication of some of them. 13. “Inside Out,” along with “Slow Song for Mark Rothko,” are available online at Light and Dust Anthology of Poetry. 14. 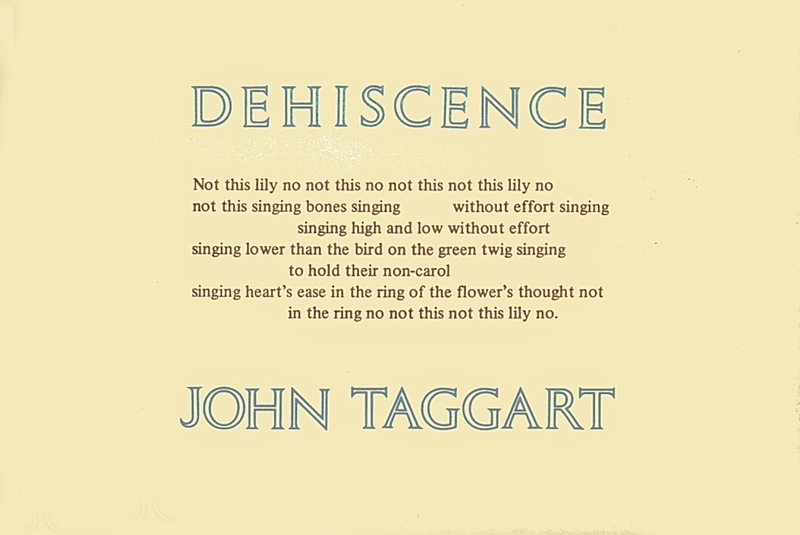 John Taggart, Dehiscence (Milwaukee: Membrane Press, 1983). 15. Rochelle Ratner and Karl Young, “Two Approaches to John Taggart’s ‘Slow Song for Mark Rothko’ and ‘Inside Out,’” John Taggart issue of Paper Air 2, no. 1 (1979). 16. John Taggart, “Slow Song for Mark Rothko” and “Inside Out,” Light and Dust Anthology of Poetry. 17. John Taggart, There Are Birds (Chicago: Flood Editions, 2008).